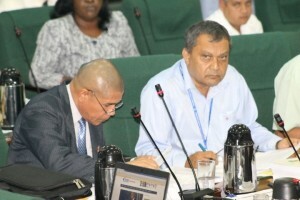 FLASH BACK: The Chief Executive Officer of the Georgetown Public Hospital Corporation, Michael Khan (right) assisting Public Health Minister Dr. George Norton in responding to questions by the opposition during the National Assembly’s consideration of the 2015 Budget Estimates. The Chief Executive Officer of the Georgetown Public Hospital Corporation, Michael Khan has allegedly cheated GYD$1.4 million in income taxes, and a government-ordered probe has since recommended that he be punished. “We consider this action by the CEO as a serious breach of the law and an abuse of his authority warranting some sanction by the Board of Corporation,” states the 88-page document. News of this instance has surfaced at a time when the Attorney General and Minister of Legal Affairs, Basil Williams has been mandated to study the report and offer an opinion on Khan’s future to Cabinet. That is against the background of the current Board of Directors allowing him to resume duties after the probe. The report states that Khan instructed a top official of that health care facility not to make the deductions, according to a special probe ordered by the Finance Minister. The Special Investigation into Financial Operations and Functioning of the GPHC, which was conducted by the Accounting firm of Ram and Mc Rae, found that the hospital board had granted approval for Khan to be paid a responsibility allowance of GYD$100,000 from January, 2011. The payment ended in September, 2014 giving a total of GYD$4.4 million and attracting taxes of approximately GYD$1,413,240. Public service rules state that allowances should be paid for performing higher duties than those attached to the employee’s current position. At the same time, the investigators found a number of the recommendations quite useful, supporting many of the recommendations in the report. According to the report, they include a complete overhaul of the statutory form of the GPHC, establishment of an array of policy and procedures for all functions and departments, the computerization of the finance department and materials management. The probe also found that there was poor internal control and the absence of Standard Operating Procedures for departments especially Finance and Pharmacy that overall has led to micromanagement of the GPHC by the CEO in areas such as all payments of petty cash, payroll, payment to suppliers etc; the signing of contracts, handling of purchasing and mailing of bank drafts to overseas suppliers and approval of all requests for purchases.